Lisa Tawn Bergren is the best-selling author of eight novels, three novellas, and two gift books, with more than a half-million books in print. 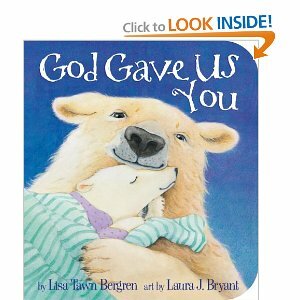 God Gave Us You is her first children’s book. As an editor during the week and a writer on weekends, she makes her very-messy-but-cozy home in Colorado with her husband, Tim, and their daughters, Olivia and Emma. Laura J. Bryant attended the Maryland Institute of Art, where she received a strong foundation in drawing, painting, and print-making. Illustrating children’s books has provided her with both a rewarding and creative career. Laura’s clients have included Simon & Schuster, McGraw Hill, and Stech-Vaughn publishers, among others. She currently lives among the tidal rivers on the eastern shore of Maryland with her loving husband and curiously cantankerous cat! i loooove God Gave Us You! it's one of the cutest books i have ever read.